How do you like the SAP EA Explorer and its content? This summer, the SAP EA Explorer will turn 4 years old. Back in 2013, we have started with just an idea and a couple of topics described in the context of user experience. Today, we have more than 400 topics in the context of user experience, landscape architecture and the Internet of Things and provided a home for topics like the enterprise UX strategy or the enterprise IoT strategy. Besides the core content we have created inside SAP EA Explorer, we have started to complement it over time with our whiteboard videos and a lot of blogs in this community. Maybe it is a good time to ask what you like and probably what you don’t like. How satisfied you are with our content incl. videos and blogs? How much time do you save by using SAP EA Explorer as your information source? And of course, whether or not you have a Twitter account, we would be happy to see your feedback here in the comment section. 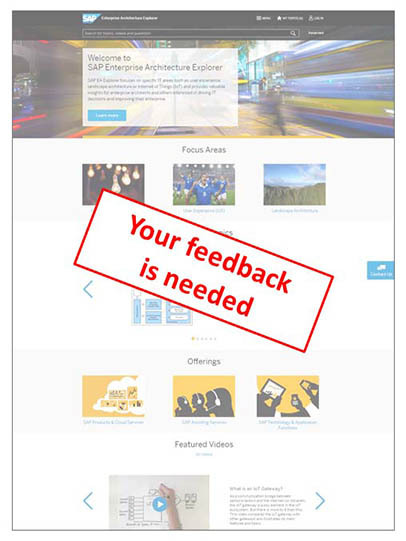 As you can see from the Twitter polls, we are primarily interested in your overall satisfaction with our content and some rating on whether or not you can save time with the Explorer while gathering the information you are searching for.